There are many options for aquatic exercise and sports on this island.Â Swimming is an outstanding way to stay aerobically fit.Â Â And the Caribbean Sea is, of course, a delightful place to swim or snorkel. Â One can easily be mesmerized by the underwater fantasy land while swimming or snorkeling in the Caribbean.Â But itÂs important to be aware of the nearbyÂ boat traffic if you are swimming Â on this popular island. And at certain times of day youÂll have the entire pool to yourself...Â The swim lanes are artistically Â marked using an easy to follow underwater tile pattern.Â There is no skin drying chlorine in this pool.Â A sophisticated computer system controls how much salt is added to the water to Â maintain a proper pH balance.Â If youÂre sensitive to chlorine, this is a real plus. 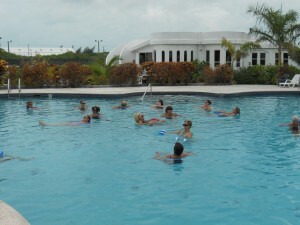 But thereÂs yet another aquatic option that many people on this island prefer Â Aqua Fitness classes.Â The aquatic fitness classes taught on the island are perfect for people whoÂve had joint or other injuries that prevent them from participating in strenuous exercise.Â Any exercise program in the water places minimal stress on ones joints and body, as compared to high impact fitness options. The necessary equipment is provided in the class.Â YouÂll never break a sweat in this class!Â Â Â As a group, we tend to socialize a bit in class as well.Â We have a great time while we work out.Â I like the approach of exercising our bodies and funny bones at the same time.Â ItÂs the best of both worlds since we often have a good laugh in this class. 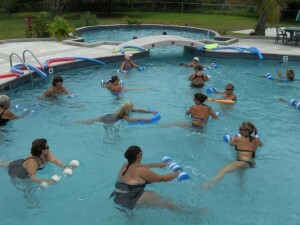 Practicing aqua fitness in the water will allow you to build up muscle and core strength while protecting your joints.Â The view and camaraderie make it an especially enjoyable experience. Â We often note the migrating birds flying over the pool while we work out.Â The view of the Back Bay is enticing.Â Â But most of all, this group class is a very supportive environment in which to get into shape. IÂll admit that more women than men join this class.Â But we do have a few daring guys.Â The age of the members varies from the 20s to the 70s.Â This is a drop in class, so anyone can join at any time. So, when you visit San Pedro, if you are looking for a fun way to cool off and burn calories in a group aquatic environment, head over to the San Pedro Club Pool for aquatic fitness and fun.